Helping Hands has embarked on its most significant recruitment drive for several years in Tynedale and the west of Northumberland. A publicity and media campaign has been designed and implemented to combine local cinema, bus and press advertising with door-to-door leafleting to more than 16,000 homes. 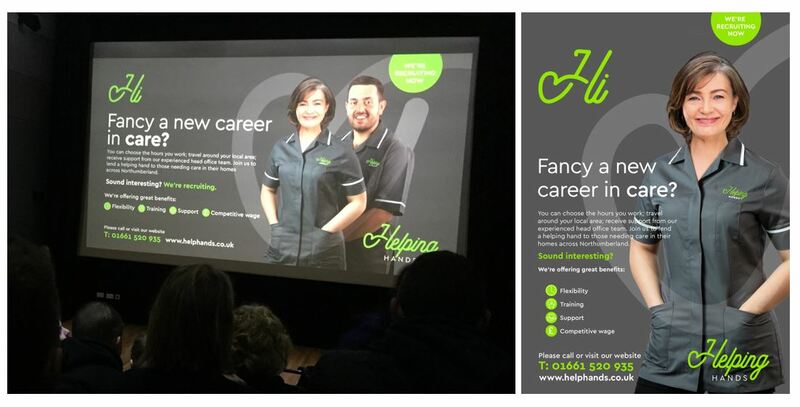 Advertising began at the start of March with ads showing at Fuse Cinema, Prudhoe; the full campaign, which will see leaflets dropped into homes in Hexham, Corbridge, Bardon Mill, Haltwhistle, Chollerford, Acomb, Otterburn, Bellingham, Wark and further afield runs until the end of May. We currently have a team of around 450 homecare workers operating across the entire county and need to recruit at least another 50 to provide better and more sustainable services. Managing director David Harrison explained: “Homecare work suits a range of different people, often at different stages of a person’s life. The flexible nature of the job, working around local communities and the weekly hours means it can be attractive to anybody who has a caring attitude and wants full or part-time work. “Our rates of pay are better than the industry standard and we offer all new care workers high quality training to meet the different needs and deliver the best care in the sector.” Past experience in the sector is not essential. Anyone interested in finding out more should contact 01661 520 935 or visit www.helphands.co.uk.